Superman is held captive by Lex Luthor and the government. He nearly breaks free but is brought down by a powerful electrical shock. Luthor orders another try at getting a blood sample as John Henry Irons bursts into the room and declares that the torture Luthor is inflicting on Superman is unacceptable. The attempt at getting a blood sample fails and Irons quits in protest of the entire operation. Elsewhere tests are performed on Superman's cape as Lois tries to convince her father of Superman's heroism. Back inside the torture chamber Superman is exposed to Sarin gas but manages to shake off the effects and even laughs at Lex when it is suggested that Superman is a shape changer. Outside the complex Lois talks to John Corben. Inside Superman has finally had enough of everyone's crud and breaks out of his restraints. After threatening to break Luthor's neck he grabs his cape and makes his way towards the room where his rocket is being held. He touches the craft and it begins speaking to him in Kryptonian. 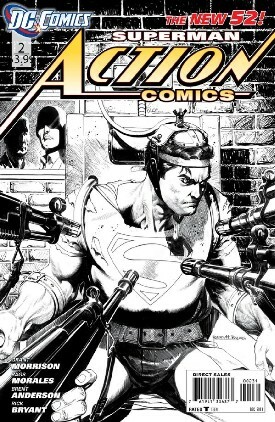 Suddenly soldiers break in and Superman takes out their weapons with his heat vision before leaving. He bumps into Lois on his way out and then leaps off. Back at the lab John Corben has Professor Vale let him into the lab that contains an experimental suit of armor. From his limo Lex Luthor yells into his phone at his mysterious contact and wonders who or what he has been talking to. High above Earth a strange looking space craft looms. Story - 3: This issue had a lot going for it. The scenes of Superman in "chains" or strapped to a chair (six of one, half a dozen of another) were well written. I liked the characterization of Lex Luthor. It was neat seeing John Henry Irons this early in the game. Lois was super cool throughout the issue and the two cliffhangers (John Corben walking the path to becoming Metallo and the alien ship Lex is talking to which hopefully will turn out to be Brainiac) had me fairly excited to see what happens next issue. So it was an enjoyable issue or at the very least it had all the elements of an enjoyable issue. Too bad a lot of this ground and was covered in SUPERMAN: SECRET ORIGIN a year or two back. The re-treading of similar ideas is my main sticking point when it comes to this issue. 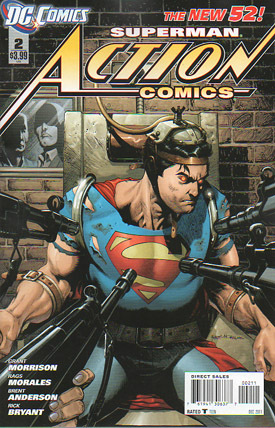 Maybe I misheard or misread the hype surrounding Grant Morrison's bold new ACTION COMICS but everything that came out about this series seemed to indicate that Grant was taking Superman in this fantastic new direction and blazing new ground while keeping an eye towards the Golden Age version of the character. He's succeeding on that last part. I do get a genuine Golden Age vibe off of this Superman but just about everything else seems to be coming from what Geoff Johns set up in SECRET ORIGIN and that bugs me. Lex Luthor and Sam Lane working together. John Corben having a thing for Lois Lane and seemingly about to become Metallo. Superman fighting the military. Lex and the military mistrusting Superman because he's an alien. We've seen this before. Morrison is putting a nice shiny coat of paint on it and fixing certain flaws I found in Johns' SECRET ORIGINS (I like Corben as love struck rather than an abusive jerk) but I was expecting something more from a revamped DC Comics. I hate feeling that way too because for one thing I liked the first issue a lot and for another I did enjoy how this issue played out. Morrison definitely has an idea of who Lex is as a character and I like the flaws that he's layering in. This Lex seemed less like the Lex from ALL-STAR SUPERMAN that we saw last issue. Superman was great, especially when he finally had enough of everyone's crud and broke out. This was fantastic because Superman out maneuvered and out thought Lex Luthor. I loved that. I mentioned John Henry Irons before and I'll bring it up again because I like that he was brought into this series so early and that he apparently had something to do with Metallo, which hopefully means he'll get his own suit of armor one day. I even felt bad for Corben because it is obvious he has a thing for Lois even going so far as to grow a Magnum PI mustache because he thinks she'll like it but looks absolutely crushed when Lois talks about Superman. I also like the scene where Superman threatened to break Lex's neck. That is a very Golden Age Superman move and I get the feeling he was bluffing. So I liked the issue but the nagging thought that I had seen all of this before (and recently) kept popping up again and again. I am still looking forward to seeing where Morrison is going with this story and this version of Superman but I also hope that he starts doing more of his own thing rather than retreading the ground Geoff Johns covered. Part of me wishes that I would have just skipped the commentary section at the end of this issue. There were parts I really enjoyed and I liked the insight we were given, especially concerning the new version of Krypton. Certain comments made by Morrison and Morales...well, frankly they made me mad. At one point Morrison writes in regards to Clark's motivation, "He's a kid who's been set free from Ma and Pa Kent." While I appreciate where Morrison is coming from in terms of explaining why Clark is going so hog wild in terms of dishing out social justice I resent the idea that dead parents set a person free. For one thing Ma and Pa made Clark who he was. Without their guidance and love we wouldn't have a Superman. For another the death of a parent, especially both parents, is extremely traumatic, so I wouldn't call that being set free. It was Morales' commentary that really bugged me. "Superman back in the '40s was more relevant than Superman of recent years because things hurt him. There was a danger to that." That comment proves to me that Morales is making the same mistake that so many creators do when it comes to the Man of Steel and that mistake is thinking that the biggest problem with Superman is that he is too powerful. One, plenty of things have hurt Superman physically in recent years. He has gone up against a number of bad guys (Metallo, Doomsday, Mongul, Cyborg Superman, the Superman Revenge Squad, etc.) that can and have hurt him on a physical level. Beyond that the key to Superman is not what he can do or his invulnerability but what he chooses to do with his powers. It drives me freaking crazy when creators bemoan the idea of writing or drawing Superman because they think Superman's powers inhibit creativity. Morales said at one point in the commentary, "I love that he's been brought back down to Earth. That's the way it should be." While I like the idea that this Superman was less powerful when he started out we are still seeing the very super powered present day Superman over in SUPERMAN. So going with Morales's line of thinking is the Superman in the other title the wrong version of Superman and the one appearing in ACTION COMICS the right way to do the character? It seems odd that DC would put this sort of commentary in its own book while trying to convince people to also read and buy the stronger, more super powered version of the character over in SUPERMAN. So yeah...kind of annoyed by Morales' comments and could have really gone without reading them in the actual comic. Art - 4: I continue to like the art in this series. Morales and Anderson brought a lot of raw emotion to the scenes where Superman was being tortured and I really felt for Clark in those sequences. The action was intense and I especially liked the shot of Superman turning around and using his heat vision on the soldiers. The alien designs were cool as well. Art wise I have no real complaints about this issue. Cover Art - 4: I like this cover a lot with the exception of the heat vision eyes. I've gone on in the past about how clich� I think they are so I won't bore you by going into that again. I especially like the shot of Sam Lane and Lex Luthor looking through the glass behind the brick wall. That was a nice touch. Variant Cover Art - 3 (Ethan Van Sciver): This is a fine cover but there is something about Van Sciver's Superman that I just don't like. The composition is great. 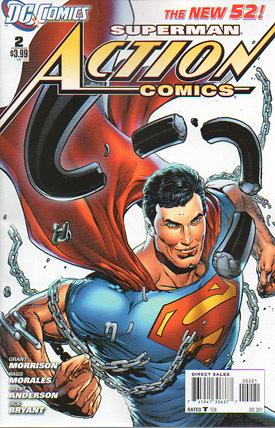 I like the idea of Superman breaking through chains on the cover of a story titled, "In Chains," so that matches things up nicely. It's the face that is getting me. It looks...smarmy. Sleazy even. I just didn't care for it. Variant Cover Art - 4 (Black and White): As with last issue I almost prefer this cover to the colored version. You see a lot more of the detail put into the pencil work. The only thing holding this back is Superman's eyes, which make him look as if he's about to change into the Hulk.